The TVB Anniversary Awards is Hong Kong’s most talked about awards ceremony, drumming up anticipation months prior to the event. On December 13, Anthony Wong (黃秋生) and Nancy Wu (胡定欣) respectively won Best Actor and Best Actress with wide popular support. Besides Anthony, who was a hot favorite to win since the broadcast of Lord of Shanghai <梟雄>, his co-star Wayne Lai (黎耀祥) was another popular pick. Another top contender for the award was Ruco Chan (陳展鵬) with his role in Captain of Destiny <張保仔>. Earlier polls between TVB artistes showed that Ruco was their TV King of choice. However, in the official voting for the Anniversary Awards, polls showed that Anthony won by a landside, beating out Ruco by over 30,000 votes. The results of the Best Actor and Actress awards were originally to be comprised of both audience voting and an internal professional judging panel. However, TVB failed to reach a consensus and decided to fully utilize the audience voting system in determining the winners of the night. Thanks to the new complete voting system – Nancy edged out Kristal Tin (田蕊妮) by a thousand or so votes to win the TV Queen title. After finding success in the film industry, Anthony’s return to TVB was met with much enthusiasm and his performance in Lord of Shanghai won rave reviews. The broadcast of the Anniversary Awards averaged 29 points in viewership, but the ratings peaked at 35 points during Anthony’s acceptance speech. Due to Anthony’s landslide victory, his win remains uncontested. However, Law Ka Ying (羅家英) was upset over his wife Liza Wang‘s (汪明荃) loss to Nancy Wu. Ka Ying took his irritation to Weibo, where he wrote about how Liza should not even bother competing in these types of awards races anymore. I like Nancy but she shouldn’t have won for GOR. Liza should have won. I have doubts about the validity of the article’s information. If the result was based solely on the viewer’s vote. I’m sure the winners would be different. TVB is the LIAR! Ruco Chan had won all Polls, how could he not win the TVB Fun Poll? Its the cheating game TVB is playing….Cheapo! The winner of TVB King award is definitely rigged! Dont think that the supporters are fools!!! i like nancy and she’s a great actress but i don’t think she really shined in her role. i don’t think liza should have won either, never really liked her acting anyway. Wait, wait. So the BAs are all audience votes? WTH.. Though I’m glad Anthony won but that sounds eff’ed up. To erase doubts tvb shld hv revealed the breakdown of votes like they did during 2013 presentation ceremony. Anyways they can say what they want. Whether people believe them or not is another matter. @isay sometimes its being courteous of not showing it for example like in this case beaten out over 30k which you ignorant always claim RUCO is very popular. lol. Of course you can dont believe but still this is a very prestige awards and broadcasted live in many countries worldwide. Just read the TVB forum page and one can see how the majority of voters favour Ruco as TVB King. Anthony , no doubt, deserves the title but there is no need to come up with a hoax figure just to convince people. TVB can rig and say anything it wants to. @rucolove can show proof the majority you meant on tvb forum how much the sampling size? @rucolove I can’t help but laugh at them for putting on a fake smile in front of the camera. Just by their facial expressions, you can tell Ruco and Liza are really obsessed with winning the TV King and Queen award title. @unknown it’s clear to see Ruco disappointed losing TV King award. While the TV Queen award went to a younger actress who also worked very hard all these years, i really wonder why anthony wong got it. @janet72 I don’t understand what’s the big deal about winning an award? Why do some actors become so obsessed with winning an award? Comments with reference to my comments are welcome. However trolls will not be entertained. Trolls can talk to themselves. If the audience can differentiate between Best Actor and Most Favourite , then there might be some true in it. I do not see why the news or TVB choose to make something entirely false especially when Ruco is their own biological son plus the fact that the media has repeatedly reported that he is hottest TVB star current both in HK & SEA . Pointless for TVB to upset the audience at large and goes against their wishes. Moreover, reading from other sources the rating for this anniversary awards was 29 points, peaked at 35 when Anthony gave his speech. As usual, there were the public who wrote in to complain about the results . But none of the complaints were against Anthony winning the BA. 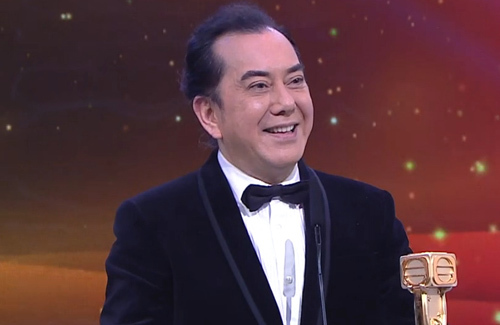 Anthony Wong is never an actor with huge fan base like Ruco due to his looks, personality and the roles he plays in the 3-rated films. However, no doubt the HK public in general acknowledge that he is a superb and versatile actor. @grace RUCO’s fan should be feeling happy luckily the most favourite awards consists of professional judgers’ votes. If its 100% public, confirm he wont be getting it but instead other actors like wayne or anthony might be getting it since Anthony wong won by a landslide of 30k votes against ruco! ps: yup,sure its peaked. Look at Anthony’s speech his quality and standard 9.5/10 compare with Ruco’s speech 5.5/10,he still got a long way to go. Truth hurts. Pretty surprised. I was half-expecting Ruco to grab the Best Actor award after so many awards and fan votes he has received this year. Most Favourite Male TV Character is me is good enough. @anthony I can’t help but laugh at them for putting on a fake smile in front of the camera. Just by their facial expressions, you can tell Ruco and Liza are really obsessed with winning the TV King and Queen title award. “However, TVB failed to reach a consensus and decided to fully utilize the audience voting system in determining the winners of the night. How can TVB fail to reach a consensus and change the voting system completely to accomodate who they want to win? If the 50% audience vote + 50% professional vote determines that Kristal Tin wins by even 100 votes, she should have won the award! Similarly, if Nancy won by 10 votes, she should have won. They can’t rig the voting system to change to audience vote only just so they get who they want to win?!?! @mike We wont know but since they came out with such a news means its credible unless you can prove them giving fake news. Since among the professionals judger they cannot reach a consensus so its right to make it 100% on public votes. Just like election. But of course audience votes are sometime BS(because they are not professionals) but still the last resort to sort things out. lmao at those who said that the ratings peaked “due to” (as opposed to “during” which is fact) Anthony’s acceptance speech. It likely peaked at that point cos audience tuned in to find out who won the BA. It could have been any of the winners giving the acceptance speech and would still have peaked. The ratings usually peak when announcing the ba every year, not only Anthony Wong. His interview after the award presentation has only 23 points. What is the purpose of this article anyway? But that interview is not just on him , for other winners as well with some TVB artiste.